I have had a busy schedule of late with courses and shooting for myself. On Friday the 19th of Sep 08 I did a private course with a nice lady all the way from from Lightening Ridge, NSW (the home of private Opal Mining) who was in Sydney on business. After a day of shooting and teaching we ended the day at Observatory Hill and while we waited for the light to change I quickly picked up my Canon and shot a few different compositions. This shot was hand held at 1/50 of a sec at F8 / 200 iso. 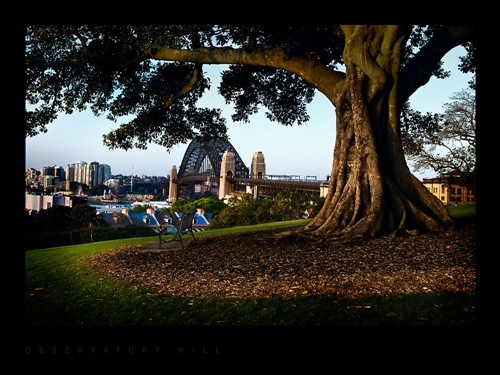 If your looking to get the most out of your digital or film camera and are wanting to understand how to shoot and create images like this of your own, then my courses run every month at numerous locations around Sydney and private courses can be booked at any time. This entry was posted in Archives, Uncategorized and tagged observation hill, observatory hill sydney, private photo workshop sydney, sydney photo courses. Bookmark the permalink.